To attack the sun, to drive it from the universe, to create perpetual darkness – what an outrageous proposition! But Donatien Alphonse François, Marquis de Sade, was an outrageous man. He took on many roles: writer, revolutionary, philosopher, libertine. He disdained the social norms and he demanded unrestrained freedom. He questioned every assumption about love, beauty, even violence, and he ignored the taboos. He wanted to attack the sun and ignite the world, liberate us from our preconceptions, break down the barriers which keep us from accepting our own desires. We identify with him, because we try to do the same. Which is why Etat Libre d’Orange has chosen to celebrate a man who celebrated extremes. 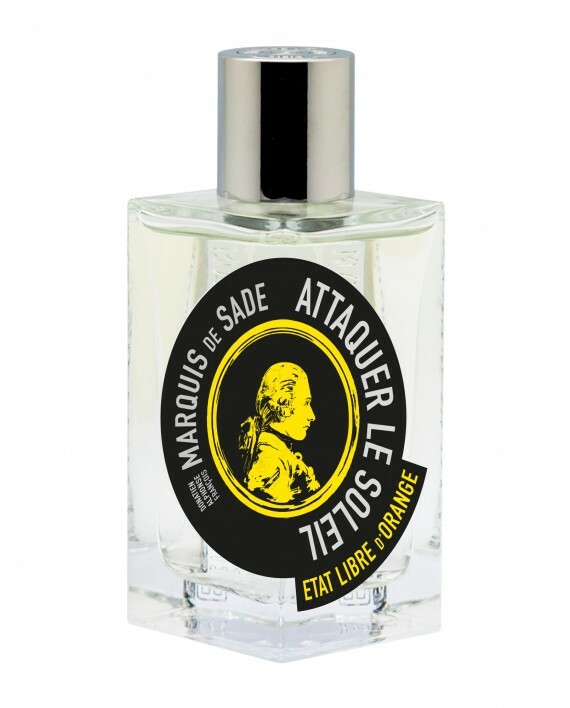 The Marquis de Sade has joined the family of outrageous perfumes. He has accepted with pleasure . . . and maybe a little pain. Etat Libre d’Orange and the Marquis de Sade. It’s a marriage made in heaven, or possibly in hell. Either way, it works. Together, we launch an assault on the sun. A tribute to Donatien Alphonse François, the Marquis de Sade. Nothing is sacred.